of response. After any two-year period of editing Bright Light stories about how local United Methodist Women members are serving their communities and raising funds to meet their annual Pledge to Mission, it’s exciting to see some of the places in the world where those love offerings are at work making life better for women, children and youth. Preparing the maps, however, can be exasperating. For one thing, some of the funds support projects serving rural communities so small that cartographers are either unaware of them or deem them too insignificant to place on a map. And this starts a treasure hunt—as in, Where in the world is Baraka and Mboma Fizi, South Kuvi in the Democratic Republic of Congo?—that can last for hours or until placing the ministries symbol on the district of South Kuvi, which mapmakers do acknowledge, becomes a very good idea. Second, the Mission Giving maps change each year, as United Methodist Women directors approve new projects for funding annually. So why do the mission maps? So we as United Methodist Women members can encourage ourselves in the work of the Lord. As gospel artist Marvin Winans has sung: We don’t know all the lives we touch with love. So you gotta keep on working. 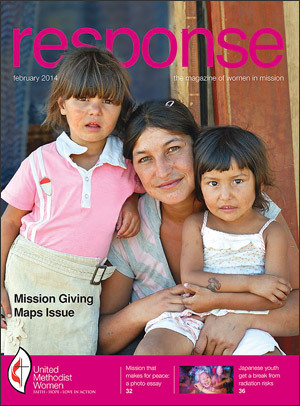 United Methodist Women members, read this issue and rejoice! Your labor is not in vain. This entry was posted in From the Editor and tagged February 2014, international, maps, ministry, Mission Giving, national, Pledge to Mission. Bookmark the permalink.